Africa Initiative for Governance (AIG) on Friday, November 10, held its Panel of Advisors’ Meeting and Roundtable – a lively and constructive discussion amongst Advisors and other enthusiastic participants, on effective private sector collaboration as a vehicle for the development of a high-performing public sector. The event was held in Lagos. 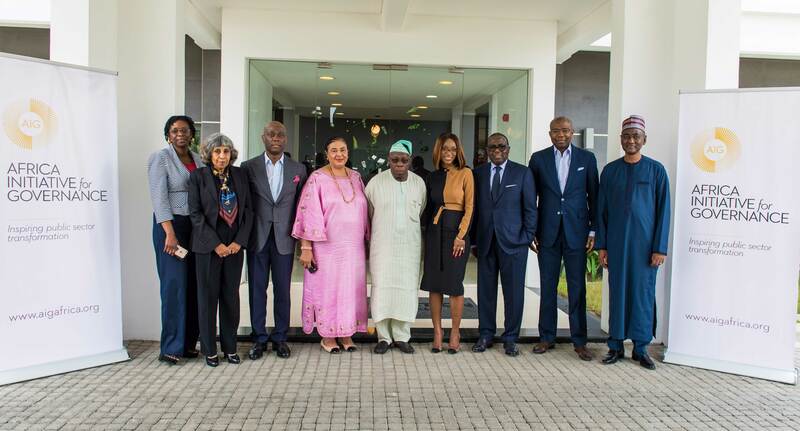 L-R: Ms. Bolaji Agbede, Participant, Africa Initiative for Governance (AIG) Roundtable, Dr. Jeya Wilson, Director, AIG; Mr. Herbert Wigwe, Director, AIG; Dr. Ajoritsedere Awosika, Participant, AIG Roundtable; His Excellency Chief Olusegun Obasanjo GCFR, Chairman, AIG Panel of Advisors; Ms. Chienye Ogwo, Chief Executive Officer, AIG; Mr. Ernest Ebi MFR, Member, AIG Panel of Advisors, Mr. Aigboje Aig-Imoukhuede CON, Chairman & Founder, AIG; Alhaji Abubakar B. Mahmoud, SAN OON, Member, AIG Panel of Advisor.